The Hôtel Carlton Lyon - MGallery by Sofitel building is a memorial to Georges-Eugène Haussmann’s ambitious plan to rehabilitate France’s intercity neighborhoods during the late 19th century. Shortly after the building became a hotel, it became one of the preeminent businesses in all of Lyon. By the early 2000s, Sofitel would save the structure, subjecting it to a renovation to preserve its distinct historical charm. The Hôtel Carlton Lyon is a historical treasure. Guests will encounter an relaxing atmosphere within each one of the Hôtel Carlton Lyon’s 80 guestrooms and suites. These accommodations feature an assortment of classical décor that reflects the hotel’s impressive past. Le Bar du Carlton offers a menu of classic French cuisine, as well as a vast selection of fine wines and champagnes. One of the Hôtel Carlton Lyon’s best kept secrets is the excellent Cinq Mondes Spa. Guests will also admire the Hôtel Carlton Lyon’s intimate meeting room, which radiates the city’s quaint charming aura. 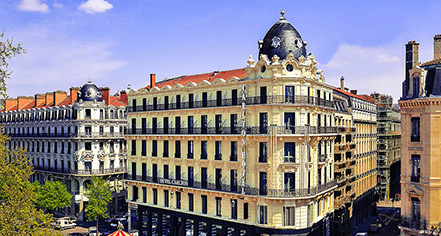 Home for this marvelous historic hotel is the spectacular City of Lyon. The Hôtel Carlton Lyon resides within the city’s famed Place de la République, which has been part of its celebrated UNESCO World Heritage Site since 1998. Cultural attractions abound nearby, too, such as the Musée des Beaux-Arts and the Opéra Nouvel. And with the Cordeliers metro station just a short walk away, guests at the hotel can easily access Lyon’s historical city center known as the Presqu'île. Start experiencing this remarkable destination first-hand by making a reservation at the Hôtel Carlton Lyon! 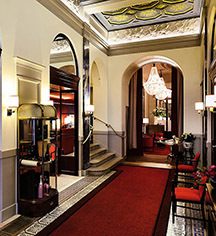 The Hôtel Carlton Lyon - MGallery by Sofitel, a member of Historic Hotels Worldwide since 2018, dates back to 1894. Famous French actor and director Patrick Chesnais enjoys rehearsing his lines in room 322, which is now named after him. Adjoining Rooms: The property has adjoining/connecting rooms, which are subject to availability and can be requested by contacting the property using the number on the booking confirmation. Age Requirements: No age requirement for check-in. Extra Person Fees: Older children/adults may stay at the price of EUR 30 per person per night in an extra bed. Hotel/Resort Fees & Taxes: A tax is imposed by the city: EUR 1.65 per person, per night. This tax does not apply to children under 13 years of age. Payment: All forms of payment are accepted. Payment is required at time of booking. American Express, Diners Club, JCB, Mastercard, and Visa are accepted. Pet Policy: $15.00 per pet, per day. The Hôtel Carlton Lyon - MGallery by Sofitel building is a memorial to Georges-Eugène Haussmann’s ambitious plan to rehabilitate France’s intercity neighborhoods during the late 19th century. Shortly after the building became a hotel, it became one of the preeminent businesses in all of Lyon. Learn more about the History of Hôtel Carlton Lyon - MGallery by Sofitel .